*Any other Top Chef fans out there? I am currently obsessed! What a fun way to look back! I think it's really impressive when you total up how many miles you've run, and I'm totally not in to running. But wow, almost 900 miles?! That's crazy! You need to watch Call the Midwife this year, it's good. Did you get my text? Feel free to tell me if you're not interested. I'm not going to do it without some help, eeeeeek. I binge watched Alias (for the second time) this year as well (and might be a little too proud of that accomplishment)! Running almost 900 miles blows my mind. 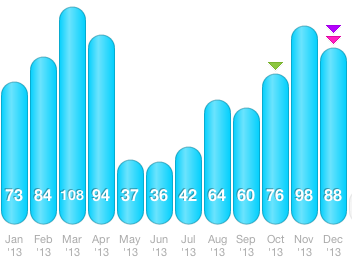 I'll be lucky if I run 2 miles in 2014. Very impressive! This is fun! I love that you burned 571 donuts. I think I consumed 571 cookies =) This would be fun to track over 2014. HOW did you track all of this? It sounds like a lot of research =). Good job on a year well done and for persevering during the hard times! Oh my goodness. I remember reading When You Decide to Love Anyway. That was definitely one of my favorites! I love this!! Makes me want to see what I've been up to....lol. Especially financially! Impressed u read 25 books!! Something I hope to do more of!! I love this kind of review! So cool! Also, The Mentalist is my favorite show. Love it. And One Tree Hill will always have a special place in my heart..NO SHAME. I love how you broke it down! 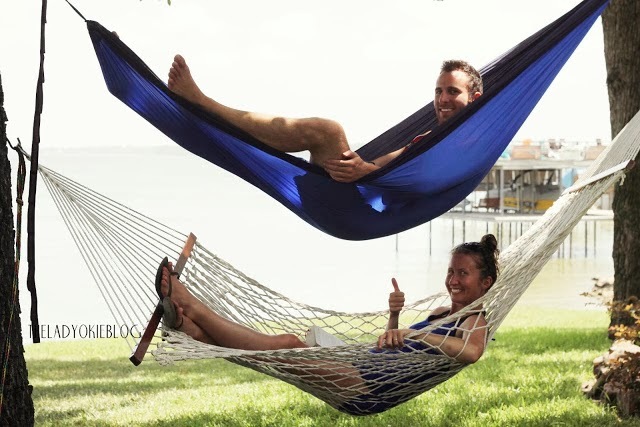 Yes more time needs to be spend in the mega hammock! So impressed you saved that much on average monthly. Congrats on a successful year! Yes on Top. Her! I've watched every season except one. Just got back from New Orleans and walked by one of the chefs restraints several times and every time I thought I don't like him, I'm not going in. But when in Washington, D.C. I went to a couple of the chefs and LOVED them. This is a very cool way to look back on the year! I am super impressed by your budgeting numbers. I would be scared to see the amount that Austin and I spent eating out in 2013. We love a good date night and usually eat out on Friday and Saturday evenings. Gee, thanks for the shout-out! I love all the categories you picked (and that neither you nor Jordan actually lost your ring haha ). I haven't been reading most year in review posts I've come across but this one was very fun to read! Love this post. Very cool. Thanks for sharing. What a great idea, I love how your separate your popular posts into page views and comments. You wouldn't think there would be a difference but for some reason it is. girl! look at all these numbers! you are organized and thorough! i have NO idea most of these numbers ;) but I love reading through this!!! the bbc Sherlock is the best! i cannot wait for the new season to come out this month! I love you and your obsession with numbers and chart and organization madness!! I wish I could remember all of this for myself in 2013! You're too good! Wow what a year! I love that you keep track of all these statistics for yourself. So fun! Wow...there would have to be a lot of record keeping along the way for me to be able to figure out these numbers as applied to my own life!! :P I do think that I didn't read much this year...probably less than any previous year of my life. 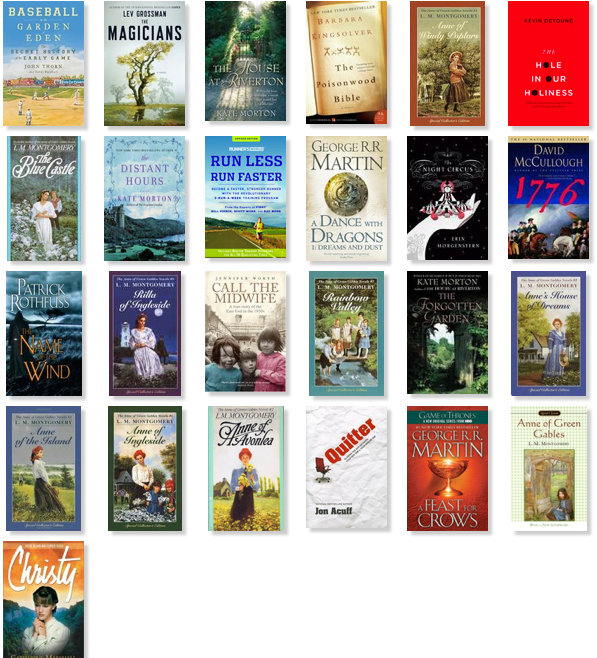 Hopefully more reading in the new year! Great way to review your year! I've been making my way through the Anne series as well (on Windy Poplars now), and I remember loving Christy when I was younger - I should revisit it this year. Yes you should. I've read it a few times. Love it! 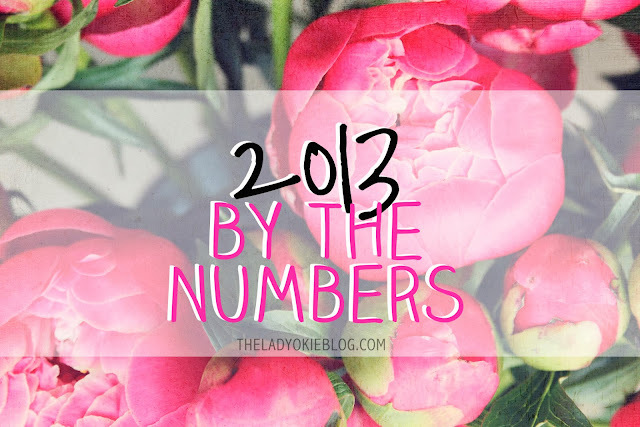 Awesome roundup of your 2013 accomplishments! I'm really impressed by how much money you've been able to save. Are you saving for anything in particular like a house or vacation? Yes! We are saving up for a house :) Hopefully next year! I've really loved reading your blog this past year. Thank you for your comments on my blog as well - I may not always comment, but I do read the posts you publish. Hoping you have a fantastic 2014! 3 Things You Should Know About. You're Welcome.